Artificial Intelligence, Machine learning, Artificial Neural Networks, Evolutionary Dynamics. Robotic navigation based on a topology of visual landmarks. Neural sound localisation for speech processing based on the inferior colliculus. February 2009 – July 2011 MSc Artificial Intelligence. School of Computing and Cognition, University of Groningen, The Netherlands. February 2010 – August 2010 Research Internship. Institut National de la Santé et de la Recherché Médicale, Stem-Cell and Brain-Research Institute, Cortical Networks for Cognitive Interaction Team, France. Since August 2011 Research Associate of Knowledge Technology Research Group. Department of Computer Science, University of Hamburg, Germany. Visual-Topological Mapping: An approach for indoor robot navigation. Artificial Intelligence Department, University of Groningen, The Netherlands. J. Davila-Chacon, J. Twiefel, J. Liu, S. Wermter. "Improving Humanoid Robot Speech Recognition with Sound Source Localisation". International Conference on Artificial Neural Networks, 2014. J. Davila-Chacon, S. Magg, J. Liu, S. Wermter. "Neural and Statistical Processing of Spatial Cues for Sound Source Localisation". International Joint Conference on Neural Networks, 2013. J. Davila-Chacon, S. Heinrich, J. Liu, S. Wermter. "Biomimetic Binaural Sound Source Localisation with Ego-Noise Cancellation". International Conference on Artificial Neural Networks, 2012. J. Bauer, J. Davila-Chacon, E. Strahl, S. Wermter. "Smoke and Mirrors—Virtual Realities for Sensor Fusion Experiments in Biomimetic Robotics". IEEE International Conference on Multisensor Fusion and Information Integration, 2012. J. Davila-Chacon. "Neural Sound Source Localisation for Speech Processing Based on the Inferior Colliculus". Proceedings of the Joint Workshop of the German Research Training Groups in Computer Science, 2012. J. Davila-Chacon, T. van Elteren, B. Hickendorff, H. van Hoof, E. Jansen, S. knuijver, C. Lier, P. Neculoiu, A. Nolte, C. Oost, V. Richthammer, F. Schimbinschi, M. Schutten, A. Shantia, R. Snijders, E. van der Wal, T. van der Zant. "BORG - The RoboCup@Home team of the University of Groningen Team Description Paper". RoboCup@Home Technical Description Papers: Germany - Iran, 2011. P. Ford Dominey, T. van der Zant, S. Lallee, A. Jouen, X. Hinaut, A. Weitzenfeld, H. van Hoof, J. Davila-Chacon. 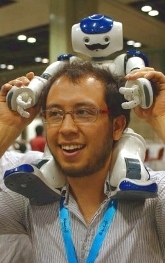 "Cooperative Human Robot Interaction with the Nao Humanoid: Technical Description Paper for the Radical Dudes". RoboCup@Home Technical Description Papers: Germany - Singapore, 2010.